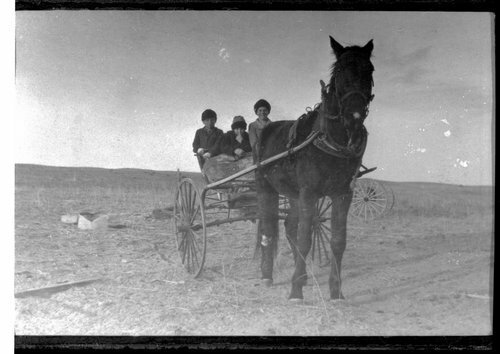 This photograph shows Frank Clare's children as they were going to school in Finney County, Kansas. Maude Elliott could have ridden with them instead of walking the two or three miles each way, but she found it more relaxing to walk. She did ride with them a time or two, but the two older children quarreled the whole time and she had to hold the smaller child on her lap. She also had work to do after school and in cold weather went early to make a fire so it was easier to walk.